On the 26th of September, 2009 it will be 40 years since the release of the last album recorded by The Beatles, Abbey Road, featuring such classics as Come Together, Something, Here Comes the Sun and She Came In Through the Bathroom Window. 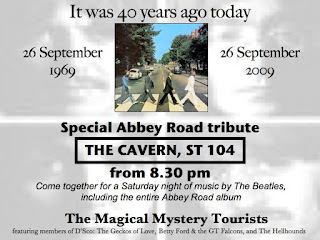 To mark the 40th anniversary of this event a loose conglomeration of Phnom Penh expat musicians calling themselves The Magical Mystery Tourists are holding a Beatles tribute night which will include performing the entire Abbey Road album. The event will be hosted, appropriately, at The Cavern, on 104 Street, itself named after the Liverpool venue made famous by The Beatles. The Magical Mystery Tourists supergroup includes members of The Hellhounds, D'Sco: the Geckos of Love, and Betty Ford & the GT Falcons, with a little help from their friends in the form of other affiliated and/or freelance personnel. Just to say a big hello from everyone here at the Cavern Club Liverpool! Hope you have a great night on Saturday celebrating the release of one of the finest albums ever! Jon, Bill, Dave & Ray at the Cavern Club.